I last saw Tomb of the Cybermen in 2013 during BBC America’s The Doctors Revisited series, where they showed it as Patrick Troughton’s representative story. Once thought to be lost forever, it was miraculously found completely intact in 1991. 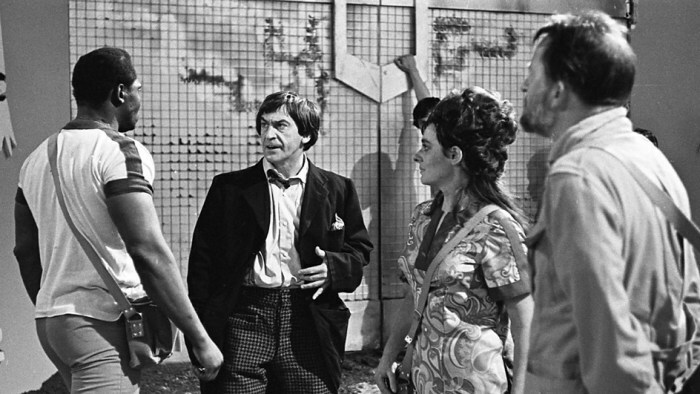 Celebrations were had and it was hailed to be the quintessential Second Doctor story. Recent years especially have cast a new light on the so-called Classic, even though Matt Smith hailed it as one of his personal favorites. Still, it’s no wonder that it’s fallen under heavy criticism given that it’s maybe not the most politically correct Doctor Who story ever made*. But is that really a fair judgement? If we consider when it was made, we do have to concede that it was very “of its time” with regards to Toberman especially, to say nothing of the rampant sexism. Those things are there and, I admit, difficult to overlook. But they’re also something that I came to expect from early Doctor Who or indeed any media from that time, and as such, they don’t bother me enough to pull me out of the story. That’s the way things were then. It doesn’t make it right, but it should maybe serve as a reminder of what was and make us happier about how, overall, things have gotten better. So, PC nightmares aside, how does it work as a story? Personally, I think it works quite well. Who doesn’t love a good doomed expedition story? It’s a classic format, and in that way, it doesn’t disappoint. You’ve got your archaeologists who are there to have a genuine expedition. I like them. Then you’ve got your rocket crew who are basically just there for protection and transportation purposes and spend most of their time complaining about how long it will take to fix the sabotaged ship (in between horribly sexist remarks to Victoria and Kaftan). Best of all, however, are Klieg and Kaftan, the completely bonkers Logicians who want to bargain with the Cybermen for power to take over the Earth. Klieg is a slimy git, but also not terribly brilliant for a so-called Logician. He’s so power-hungry that he thinks he can actually gain control of the Cybermen. And there’s really no need to discuss how that turns out because the only one surprised by it is him. Then there’s his colleague, Kaftan, who functions as his Lady MacBeth. She’s actually more insane than he is, but she’s maybe a bit cleverer. At least enough to make him do all the work and make all the mistakes. She seems to be running things much more than Klieg, and in a way, that’s a bit refreshing because female villains weren’t really as common early on. Victoria’s sweet and innocent personality contrasts sharply with Kaftan’s epic crazy bitchiness and I enjoy that. I thought their scenes together were delicious, especially when both are confronted with the blatant sexism from everyone else in the group (all men, obviously). Kaftan and Klieg are both pretty one-dimensional, but I enjoy their contribution to the story all the same. And then there was Toberman. Toberman might be the only character who has any real development in this story, which is a shame really considering the way in which he was characterized. Where he is involved, it’s pretty much impossible to ignore the racism even from a narrative point of view, but there is a bit more to him than that. 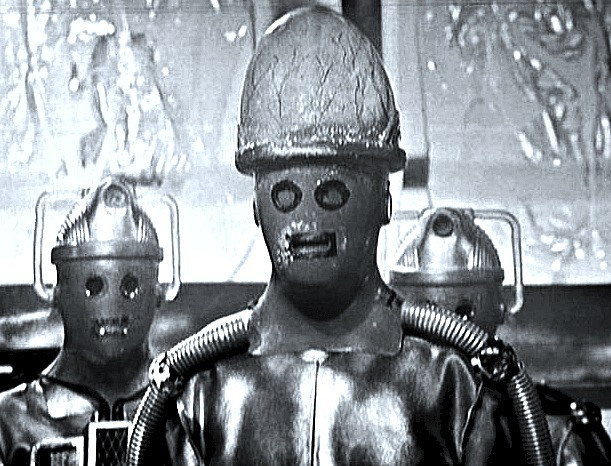 Toberman is changed by the end of the story, and not just because he’s partially converted by the Cybermen. He doesn’t see Kaftan as evil because he cares for her and she showed him at least some degree of kindness while he was with her. So even after he is converted, her death shakes him so badly that it throws off his programming. He’s so distraught that he fights back against the evil of the Cybermen and gives his life in an effort to destroy them. Right from the beginning after the compulsory “who-are-you-and-what-are-you-doing-here” bit is sorted, the Doctor sees the situation as an opportunity. This is what does make this a great representative story for Troughton’s Doctor, I think. Almost immediately, we can see the wheels turning in the Doctor’s head and we know that he has a bigger plan in mind for this adventure. Instead of stopping the stupid humans from their inevitably fatal mission, he helps them to get on with it! He has to know that people are probably going to die, but he also sees this as a chance to rid the universe of the Cybermen. So what does he do? He plays along as the bumbling fool he likes to appear to be, advising where necessary, but otherwise very quietly manipulating those around him to accomplish what he needs to. Now, this all sounds quite dark, and it is, but it’s also well balanced with some great moments of humor like we’ve come to associate with the Second Doctor. Moments like his quick joke about the length of Jamie’s “skirt” when Victoria is concerned hers is too short. Or when he and Jamie accidentally hold hands (which, frankly, is funny given how he and Jamie were constantly touching each other in their travels). One of my personal favorites is the “complete metal breakdown” joke he makes about the Cybermats. Not so much for the joke itself, but for Jamie’s reaction to it. It’s so immediate and real sounding that the first time I saw it, I almost thought Frazer Hines had broken character. There’s also that moment between the Doctor and Victoria where he plays the more fatherly figure so beautifully, and it is just so genuinely lovely that it buries the darkness we’ve seen prevailing to this point. Victoria: You probably can’t remember your family. The Doctor: Oh yes, I can when I want to. And that’s the point, really. I have to really want to, to bring them back in front of my eyes. The rest of the time they sleep in my mind, and I forget. And so will you. Oh yes, you will. You’ll find there’s so much else to think about. So, remember, our lives are different to anybody else’s. That’s the exciting thing. There’s nobody in the universe can do what we’re doing. The delicate balancing act between light and darkness in the Doctor is something that every actor to play the role has done a bit differently, even when the darkness in him always stemmed from a place of goodness-–the destruction of evil. I think Patrick Troughton really set the standard for that balance and every actor since then (from Pertwee to Capaldi) has had to make a conscious decision as to how to relate to it and when to play up one side or the other. This story is a perfect example of why. Tomb of the Cybermen also works really well for me because it adds so much to the Cybermen mythology. Even though this is already their third appearance, much of their later arc is determined by things that were introduced in this story. This is the very first time we visit Telos, which we later revisit with Colin Baker’s Doctor in Attack of the Cybermen. Telos was the home of the Cryons, but they were more or less wiped out by the Cybermen when they took over after Mondas was destroyed. 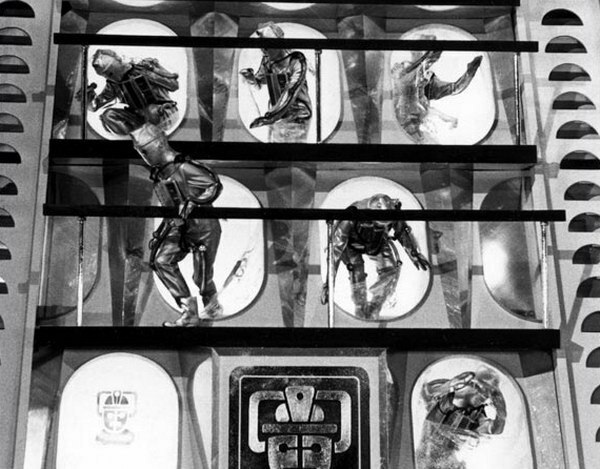 Telos held an underground refrigerated civilization, which the Cybermen needed in order to hibernate, thus creating the “tomb”. Given that this only happened because of the events of The Tenth Planet—for which the Cybermen hold the Doctor personally responsible–it cements the now eternal grudge between the Doctor and the Cybermen and creates a key piece of their arc together. After all, his enemies didn’t give him the name “Destroyer of Worlds” because they thought he destroyed Gallifrey during the Time War****. 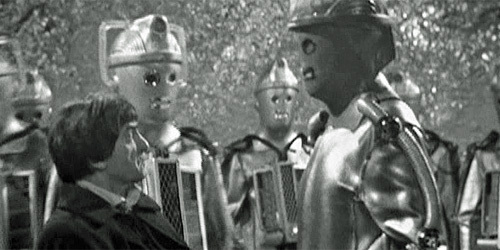 The Cybermen know the Doctor by now. He’s thwarted them twice in a big way and really has no mercy where they’re concerned because he knows they cannot be reasoned with. The Doctor sees this human expedition as a chance to destroy the Cybermen once and for all and he’s willing to make sacrifices in order for that to happen. It’s all for the greater good, which is exactly what this Doctor is all about. We also meet the Cybermats for the first time in this serial. I love these freaky little bastards. I love that they look like a robotic cross between a silverfish and a rat, which also makes them look like an old school floor polisher. There is nothing I don’t love about the originals, and it actually really upsets me that they changed their look immediately following their first appearance. There’s just something so distinct about the first ones with the googly eyes and the cute little antennae that make them both endearing and creepy at the same time. I would totally keep one of these little guys in my purse, even though Victoria would probably advise against it. They’re less endearing, however, when you delve into what was needed to create them. Back in the olden days when Ye Olde** Cybermen couldn’t convert just anything living or dead into an actual functioning Cyberman, they had to come up with other uses for those who couldn’t be “upgraded’ properly. This included cats, dogs, and even small children and babies. I love the horror factor involved there, though I admit since becoming a parent myself, the concept has become a bit more disturbing. Or, you know…a lot more***. But that’s the point, isn’t it? These creatures have no emotion and run solely on tactical logic for survival, so they don’t see the harm in dismantling a toddler to make use of its individual components. This story is also our first introduction to the Cyber-Controller, and was quite possibly the best looking one. Taller than the other Cybermen, no chest unit, no head handles, and a lovely clear domed head that showcased an impressive looking brain. I guess it was impressive, anyway. 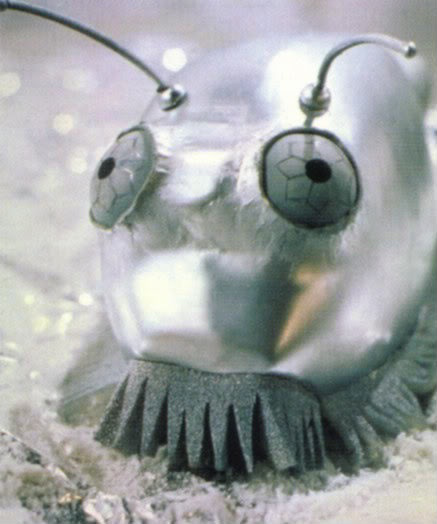 The Cybermen must’ve thought so or it wouldn’t have been made the Controller, would it? This is the General of all the Cybermen (for now, anyway) and as such he makes a more dramatic entrance than simply struggling through a door made of cling film. And when the other Cybermen free the Controller from its very special tomb (read: the refrigerator where it’s been uncomfortably crouched for the past 500 years), they all salute. The Cyber-Controller is probably my favorite part of this story (only just above the Cybermats) because not only does it look fantastic, it also gets a lot to do. I don’t care if you can see the wires when it was spinning Toberman in the air, that’s more action than the Cybermen get nowadays. It’s also the last to be destroyed, and it’s only defeated because of Toberman. It creates such an element of suspense and horror when he suddenly isn’t as dead as we thought right at the very end and nearly ruins everything the Doctor has managed to do. And I appreciate that the ending wasn’t as ridiculous as in, say, The Moonbase*****. And I can’t talk about the Cyber-Controller without mentioning one of the most iconic (and recurring) lines in the history of Doctor Who. Maybe it’s just me, but I’d much rather hear that in every story as opposed to “DELETE. DELETE.DELEEEEEEEEETE.” I think it wears a bit. Sorry, RTD. So where does this story fall on the “Classic” scale? Is it really the heralded masterpiece that it was believed to be while it was missing for more than 20 years? I think the case can certainly be made for it, even if just for Troughton’s performance alone. And it does have some other moments in it which are great solely for what they add to the Cybermen mythology. So, I think that on a story level it does work, but it’s marred by bad lines and laughable production errors and they spoil it a bit. So I feel genuinely conflicted on whether or not I would call it a Classic. Did I enjoy it? Yes. Is it my favorite? No. Where do you think this one stands? Is it a true classic story? Or did it fall flat on its big metal face? At least we know where Matt Smith stands, I guess. * Though, it may not be the least, either. ** Honestly just putting this here because of this. *** I don’t know about you, but I’d be a bit hacked off if some big metal man broke into my house so that he could disassemble my daughter and my cat and use them as parts for various killing machines. Maybe that’s just me, though. **** I realize that the Daleks are the ones who gave him that name, but even they don’t exactly have a monopoly on hating him, do they? ***** I say that with love. As I said before, The Moonbase is in my top two favorite Cyberman stories (the order of which rotates on a daily basis).